Plymothian Transit: Carmel Coaches: The End? A Devon bus and coach company has lost its licence over "woeful failures" and safety concerns. 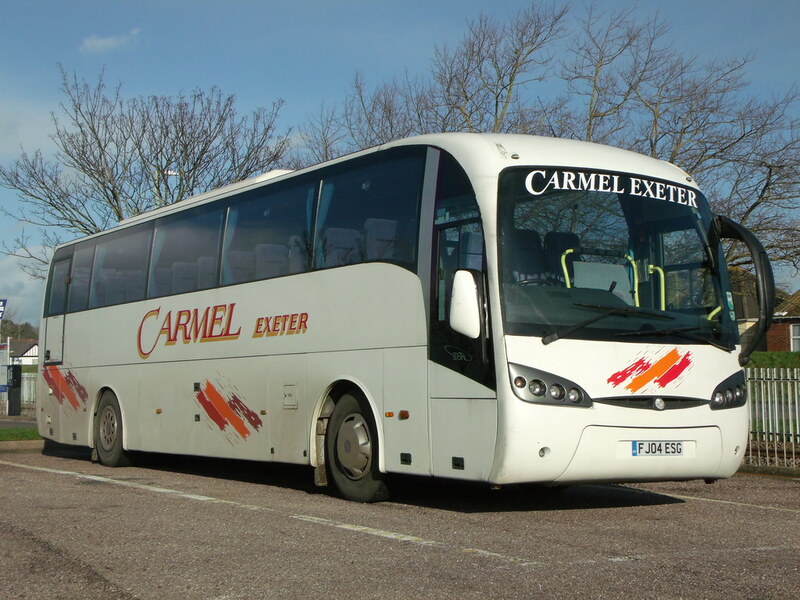 Carmel Coaches runs bus routes for schools services and private hire from bases in Northlew and Exeter. Sarah Bell, Traffic Commissioner for the West of England, has made an order to revoke its licence and those of two of its directors from the end of July. Issues included serious defects not being fixed and poor record keeping of safety issues over a number of years. The findings of the report said that in March a number of Carmel coach drivers told inspectors about "many different defects" on its vehicles. On 24 April two buses were prohibited at the roadside following the disembarking of children at a school bus check. One of the company's vehicles was involved in a coach crash at Looe in Cornwall on 13 May in which two people died. The commissioner had gathered her evidence before the crash and said that her decision did not reflect the incident. In the report Ms Bell said:" I make it clear that I have put that event from my mind for the purposes of this written decision. "The incident will be the subject of a rigorous investigation by the police and various agencies." Crossrail 2 could lose both its Chelsea and Hackney Stations When TfL released the first consultation last year, it offered a choice between a DLR-style local service, or a full scale Crossrail sized service, and unsurprisingly, the majority of comments said they wanted the big one. That consultation also offered up some suggestions, which are now being put out for a second review, which if nothing else, does remind us that consultations are worth responding to. Pembrokeshire My travels resumed in late February with a trip into Wales for the Swansea Bus Museum's running day. I decided to make a weekend of it and head over to Pembrokeshire on the Saturday. Comprehensive or Comprehensible ...  Just by way of weekend amusement, fbb imagined a possible conversation between two fictional characters, each being VIPs in delivering London's transport network. The crunch question, deftly avoided by "Peter", comes from No. 3 son. "Why is the Transport for London [TfL] web site so bad?" York Park & Ride Developments Two new park-and-ride sites in York have opened for use as the city aims to "cut congestion and improve air quality". Electric buses that will be operating from the sites have also been unveiled at Parliament Street in the city centre. The new park-and-ride sites are at Askham Bar and Poppleton Bar. "I can say we've been in business for 30 years without a passenger suffering any injury in that time and I believe that is a very acceptable safety record." He just doesn't get it, does he? If that's going be the basis of his appeal he may as well not bother.